My third year of teaching physics using modeling instruction is coming to a close and it’s fun to think back on how I’ve evolved as a teacher and what effect this has had on the students I’ve worked with. Below is a bar chart of pre and post test data for my students on a physics test called the Force Concept Inventory. The FCI is the most widely used diagnostic test in physics. I’ve used it for the past three years to assess the extent to which my students’ ideas about forces and motion have changed as a result of my instruction. While I believe that single scores are never the whole story and cannot define the complexity that lies within a student’s mind, this test has been shown to be a good predictor of performance on other ‘measures’ of physics ability. The test is generally accepted in the physics education community as a well-designed and useful assessment tool. It basically assesses whether a student can reliably choose between Newtonian physics explanations and other common ideas people develop about these concepts before taking a formal physics course. In other words, it’s a good test and is informative for a physics teacher. The specific percentages probably won’t mean much to you unless you teach physics, but you can probably notice that students’ understanding has improved…but why? Below is a table outlining some of the main aspects of my instruction from my first three years. These certainly aren’t the only aspects that have affected my students’ growth, but I’ve listed some of the things I think may have played a role in students’ understanding. I’m happy that my students have improved over the years, but I know I have a long way to go as a teacher. Since this reflection is only in regards to the teaching of Newtonian mechanics, I still have questions about how my teaching will change and improve in other ways and in other domains. I am excited about where I’m going and am extremely grateful to those who’ve helped me along the way. Here’s to another year! Major classroom discourse Students sitting in desks facing front, Whiteboard presentations – groups walk to front to ‘present’ ideas to group. Teacher asks most questions. Students sitting in groups of 3-4 facing each other and front. Whiteboard presentations – groups walk to front to ‘present’ ideas to group. Teacher asks most questions. Occasional circle board meeting. Students sitting in groups of 3 facing each other and front. Board meetings – Nearly all class discussions are teacher facilitated circle whiteboard meetings. We move the chairs and sit in a circle. Better discussion facilitation, questioning, and prompting for ideas from many students on my part. Students responding and asking more questions. structure Traditional points and %’s, few opportunities for ‘retakes’. Grade based on homework, quizzes, tests. Traditional points and %’s, few opportunities for ‘retakes’. Grade based on homework, quizzes, tests. Standards based grading, reassessment opportunities once per week. Grade based on mastery of learning goals. Homework 3-4 nights/week. Checked for ‘completion’ & included in grade. 2-3 nights/week.Checked for ‘completion’ & included in grade. Rarely. Never ‘graded’. Other -No formal modeling training.Was a student teacher under modeling teachers and used modeling curricular materials.-Force diagrams main representation for forces. -Mix of graphs/equations used to represent motion. Focus on deriving equations from graphs and using an ‘equation sheet’ to solve problems. -This is after taking a modeling physics workshop the summer before.-Had students record all notes from labs/discussion in composition notebooks that I checked and graded with ‘points’. -Force diagrams main representation for forces. -Mix of graphs/equations used to represent motion. Focus on deriving equations from graphs and using an ‘equation sheet’ to solve problems. -Heavier focus in classroom language on developing and using ‘models’ instead of traditional studying of ‘units’.-Board meetings centered around messier conceptual questions instead of computational questions. -No formal composition notebooks. Used packets of ‘practices’ for each model with some better cognitive tasks. -Model summary boards for each model. -Concept maps for links between models. -Use of more representations for forces (system schema, force diagrams, force vector addition diagram, net force diagrams). Little use of trig for angled forces. Mostly tip-to-tail vector addition. -Graphs only approach to motion. No deriving of equations. No ‘equation sheets’. Use graphs to solve problems. -More kinesthetic experiences – crashing cars for N3L lab. Pulling carts with springs for N2L lab, instead of modified Atwood. This is great! It’s interesting how long it takes to really “get” modeling. And if it takes that long for us, obviously it’s tough for the kids, too (though easier as we get better at it, I guess). I think I’m about maxing out the FCI with my Honors kids now, but my regular kids are still chilling with a 70ish average (this year is highest yet, but not making the jump to the next boundary). If I’m teaching that class again next year (not sure yet), I need to do some thinking about some changes to get them more invested. I think it’s interesting how each year, I’ve said “I’m teaching modeling.”, but it’s really looked different each year. I think some important changes in classroom discourse and language took place this year though. (in many ways, thanks to you!) Taking the second year workshop this summer will probably help me figure this out a bit more. The students from year 1 were juniors and seniors with a wide range of math ability. I’m unsure of what specific math classes there were in, but I know all students at the school at that time were required to take physics. Students from years 2-3 are at my current school. Roughly half of them, probably a little less, are taking calculus or pre-calc. 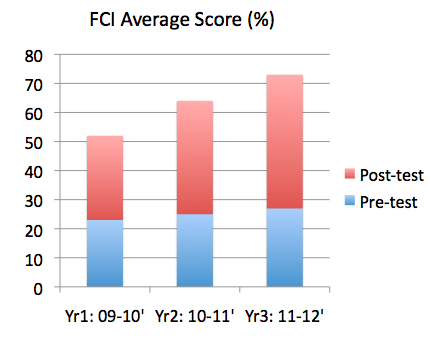 With the students I have, I can probably do better on the FCI. While students in ‘honors’ physics average higher than students in ‘regular’, I know they can do better. Honors averaged 80%, while regular averaged 68%. A lot of the in-depth analysis I would like to get to with honors, gets pushed aside to make sure we ‘cover’ everything necessary for the AP test. I’m still trying to find a balance between it all. Just catching up on My Google Reader and I wanted to say how cool it is to see your progression laid out like that. In the constant strive to improve, I don’t think many teachers take the time to look back at how they’ve changed their practice throughout the years. Thanks Brian. This reflection arose from me wondering why it was my students’ FCI scores increased…I thought there had to be some reasons. What was I doing differently? All of the little changes that I made seemed to make a difference. I’ve realized that the changes in policy/pedagogy/classroom structures are really a result of how my thinking and beliefs about teaching science have changed. It’d be fun to try to dig into that a bit, WHAT was I thinking? What did I believe and why?